Titan Squat Stand HD 1,000 lb Capacity Deadlift Lift Weight Rack 2x3 Pull Up by Titan Fitness at Strongman Pictures. MPN: HDSQST-PUB. Hurry! Limited time offer. Offer valid only while supplies last. The Titan Heavy Duty Squat Stand will help you work out safely and efficiently while performing squats, military press, bench press, curls, and more. 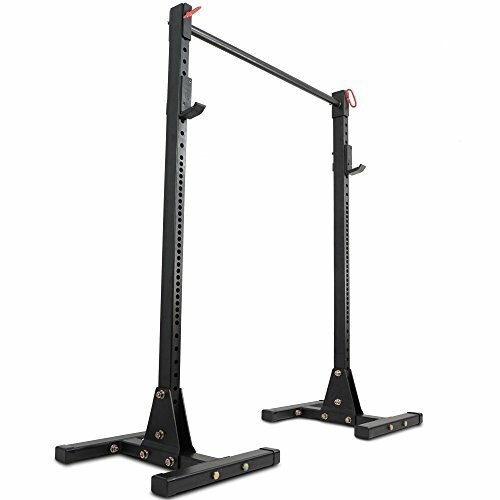 The Titan Heavy Duty Squat Stand will help you work out safely and efficiently while performing squats, military press, bench press, curls, and more. It offers a wide range of positions helping to accommodate a wide range of height and exercises. The independent upright design is extremely stable and does not need to be bolted to the floor. Many Olympic weight lifters prefer this set up for its small footprint and low profile design. The bolt-together construction allows you to easily transport and fit the rack in to any room or basement without having to worry about ceiling height. - Tough Powder Coated Finish - Weight: 144 lbs - Upright Dimensions: 2"x3"
- Height: 72" - Height of pull up bar: 69" - Base Dimensions: (W)24"x(L)26"